the first two nights in st petersburg, we stayed at a hostel. in some ways this hostel was pretty cool: great location, really clean, super comfy beds, free breakfast. but in other ways, the hostel had issues: it was pricey (25$ a bed! ), internet wasn’t working, phone wasnt working, laundry was ridiculously expensive, no hot water, and i overheard the girl who worked there talking on the phone saying how all of us were driving her crazy and she wished we would just leave. nice, huh? but anyways, all negatives aside, it was really fun to stay at a hostel for a bit. sleeping w/ a bunch of strangers in the same room may not always be the greatest thing, but it definitely pushes you to get to know everybody. we met some cool people from the UK, canada, and norway. it was fun to have people to chat w/ over breakfast etc and also i went out w/ all of them one night to watch the raising of the bridges. watching the raising of the bridges is a big deal here. since the city was built on a swamp, it actually consists of over 100 islands, separated by canals, and to get across them, there are *539* bridges. yes, thats right, 539 of them. every night, the city becomes a bit of an obstacle course, when some of the bridges are raised for a few hours at a time in order to let cargo ships through. there’s something a bit impressive about seeing a large structure capable of holding up trucks and cars all of a sudden changing shape. it’s even more impressive, when that structure is *huge*… basically a stretch of road 8 lanes across, and it all of a sudden is vertical instead of horizontal. some things in life are just a fact and never change. roads are *always* horizontal, and sometimes they are slightly at an angle, but they never go vertical… it’s just an eerie sight! so, during the nights, lots or tourists and residents of the city often come out to watch the bridges be raised. 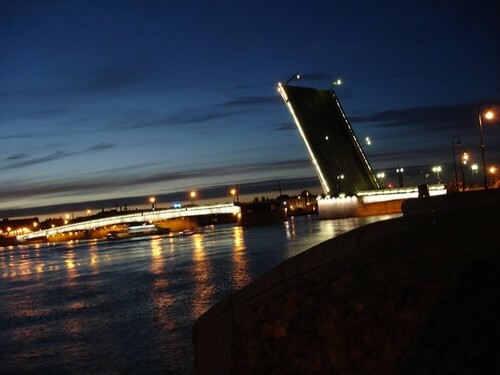 this especially is a popular activity during the white nights when it’s still light out at 2am when the bridges are raised. so, we went out one night to go see the bridges. well, large amounts of alcohol were consumed (you are allowed to drink on the streets in russia). several beers, swigs of wine, and sips of vodka later, we almost missed the moment that the bridges were raised. in fact, they were already halfway up when i noticed. unfortunately, we, thinking we were oh so clever, decided to sit on the bank between two of the bridges so we could see not one but two bridges be raised. but the outcome of this was that we were not close to one nor the other, so the whole thingh was less than spectacular. caryn and i are gonna try again in a couple of days. as wonderful as it was to have people to hang out with etc, we terminated our stay at the hostel when we found out some great news. my dad had gotten in touch w/ his cousin who lives here and she offered us to crash at her place. after paying 50$ a night for two dorm beds, this came as quite a relief. so we packed our packs, and set out to Natasha’s house. wow. i can hardly believe what a warm greeting we’ve receieved from her. she has been so unbelievably nice. she’s letting us stay at her house. she’s cooked us breakfast every single morning… and not just a simple quick breakfast either. every breakfast is practically a 4 course meal with various bliny, fried eggs, yogurt, cottage cheese, different breads, herring, etc etc. the food just doesnt stop until we’re so full (and it’s all really good!). besides that, she’s packed us snacks and lunches when we’ve gone out for the day. she’s washed clothes for us. she makes our bed for us at night. i almost feel bad having so much done for us and yet she absolutely refuses to let us help clean or do anyting. keep in mind, that other than when i was still 3 years old and living in russia, i have only met her one time!! on top of it all, she’s constantly super cheerful and always so nice! really a wonderful person! i guess i’m really lucky that my dad has such great relatives! it definitely helps to have connections here! but, our luck doesnt stop there. my dad also told us to go meet one of his closest friends who lives here. we visited boris, and he also made us dinner even though we came over fairly late at night. we talked for a while, and it was fun learning about this guy who was such a good friend of my father’s. for instanmce, we noticed some little books laying around on the table… books that looked the same as ones we had seen in my aunt’s apartment. it turns out that boris, in his spare times, writes and illustrates little books that he later gives out to people. he ended up giving us a few of these little books and explaining a little about them. it turns out that he actually hasnt had this hobby for too long… in the past, he was actually more into wood carving. so, he takes us to his room and shows us some of the carving he does. great stuff! all of a sudden i remembered that some of the little statues my parents have in their room are in the same style. turns out that they were a gift from boris. it was really cool to finally meet the person who has been the source of all these cool things… well, i actually have met him one time before for a few hours, but i just never knew that he was the one who’s made all this stuff. well, that’s not all that i discovered during that meal. i finally may have discovered the reason for my constant tardiness. i’m always late!! i really cant for the life of me get anywhere on time. turns out… my dad has a reputation of being late as well! i never knew that. so that’s where i get it from!! heh. well, so, besides being a woodcarver and making books, boris also knows a lot about st petersburg. well, ok, he actually knows a lot about pretty much everything, but especially he knows a lot about st petersburg. after dinner, we went out for a walk and he showed us all sorts of interesting stuff about the neighborhood that he lived in. stuff that we would never have found out on our own… hell, stuff that probably everyone else that lives there doesnt even know. this man has almost ecyclopedic knowledge of everything there is to know about his city, and he could tell us about the architectural style of almost every building we saw, when it was built, and the history behind it. it was really a very interesting walk! boris also knows an insane amount of information about art, and a few days later, he met us at the russian museum to show us around the chagall exhibit that was there. i dont know much about chagall. ok, lets face it, i know practically nothing about chagall. during the span of 2 hours though, i learned a ton about the artist, his life, his motivations, etc. boris was able to walk up to practically any painting and explain the symbolism behind it, and talk about what caused chagall to make such a work. it seriously just doesnt cease to amaze me how much this man knows about everything! to top everything off, he even bought us a book on chagall to take home! so nice!! so, yeah, basically in the last few days, we’ve totally been spoiled. i cant believe how much these people have done for us and how lucky we are to have met them. russians are supposed to be legendary for their hospitality, and i have always noticed that russians are willing to go way above the call of duty to help out friends and family. if you have a russian who is a close friend, they’re usually ready to do pretty much anything for you. their loyalty knows no bounds. it’s pretty amazing just how tight the bonds that russians form are. Did you ask Boris or your cousins what’s up with their comrades being so perpetually menstrual? Did you gain any insight there? i have one of his books-awesome! whoa.. i totally didnt pick up on that. too funny!